High Pressure Common Rail and EUI/EUP Fuel Systems are manufactured to tolerances which dictate that the highest standards of cleanliness must be maintained in diesel workshops. The Microdiesel Cabinet HM1000 is a clean air cabinet designed specifically for the assembly of diesel fuel injection equipment and enables diesel workshops to set up and maintain a clean area to achieve the highest standards of cleanliness. The HEPA filter used in HM1000 is capable of particle filtration down to 0.5 micron. Equipped with high intensity lighting of the work area. Equivalent to ISO-6 as specified for the manufacture of precision optics and gyroscopes. Designed to be installed on a standard workbench. It is recommended that the Microdiesel Cabinet HM1000 should be installed in an assembly area where the atmosphere is contained, this will prolong filter life. Air ventilation into the assembly area/room should be filtered to a minimum of grade F5 to EN779. 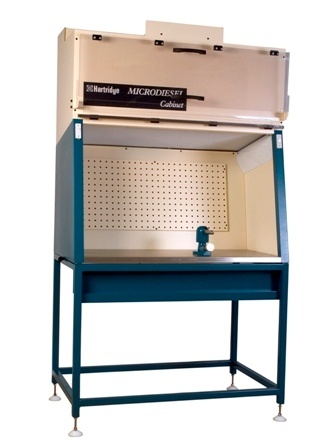 The Microdiesel Cabinet HM1000 is designed to be mounted on a work bench of the following minimum size: Height 900mm, width 787mm, length 1275mm made from 40mm square tube. Stainless Steel Cabinet (Suffix SS complete with D, H and T). Air flow meter to assess air flow and filter condition.